The man behind some of the most amazing hits to come out of Nigeria has come to the forefront and has released his own music. 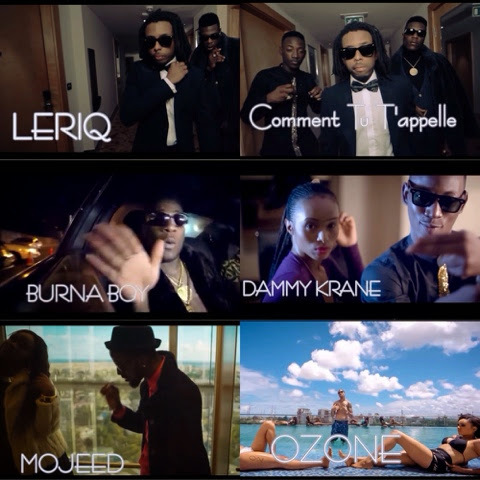 Earlier this year saw producer Leriq unveil his collaborative first single ‘Comment Tu T'apelle’, a record that showcases Aristokrat Records' recording artists including himself, Burna Boy, Mojeed and Ozone with a special guest appearance from Dammy Krane. ‘Comment Tu T'apelle’ serves as the lead single off Leriq's forthcoming debut album ‘TLS (The Lost Sounds)’. Shot in a penthouse in Lagos, director Clarence Peters captures the scenery very well by showing off the exotic pools, the casino tables, and all of the other luxurious sights that the penthouse has to offer. Leriq has been working his way to the top and countless number of times he has never failed to deliver. As his catalogue continues to grow - so does his clientele, already worked with the likes of Burna Boy, Pucado and the Aristokrat Records other recording artists, he has also worked with - Wande Coal and Waje to name a few. ‘TLS (The Lost Sounds)’ is scheduled for an August 2014 release and will feature musical heavyweights such as 2face, Burna Boy and Illbliss amongst others. Burna Boy, Dammy Krane, Mojeed and Ozone all add their own touch to ‘Comment Tu T'appelle’ to help make it the hit that it is, and do a great job at doing so. Aristokrat records' very own Pucado and Kamar make a cameo appearance in the music video, watch ‘Comment Tu T'appelle’ below!